1. Why do we need to rip Blu-ray for backup? Many people have Blu-ray discs these days yet few people got the know-how to safely back them up. If you watch a Blu-ray movie once a week, then months after months, you will have a sizable Blu-ray mountain piled up in your room. You might want to digitalize those little guys to save space, as well as to watch it anywhere at any time. Besides saving room, you may also want to transform them in case of possible damage, such as dampness or heat. Nobody would buy insurance for Blu-ray DVDs but I’m sure everybody wants to have it backed up just in case. We like to store everything on desktop and that is why we often lose data from disc C in our computer. The old saying of “do not put all your eggs in the same market” is also applicable to the actual Blu-ray DVD. But isn’t back upping movies illegal? Well, movie manufacturers remain the right to keep their intellectual property, but consumers also have the right to enjoy or backup BD movies they purchase, especially when they do not intend to do it for commercial purpose. So how do we backup Blu-ray DVDs to computer? Well, to back up Blu-ray movies, first you need to rip them off DVD discs and then save it to your computer. Saving is a better option speaking of backup because when Blu-ray movies are on your computer. They are at your dispense. You can either watch them on any media player you like or stream to other devices. To rip Blu-ray to computer, you will need a Blu-ray ripping software to help you to do that. 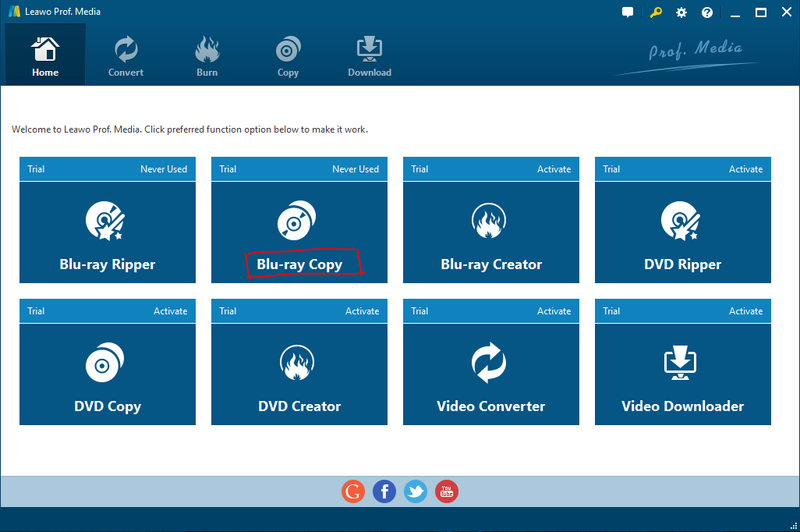 Here I would like to recommend you one of the best – Leawo Blu-ray Copy Software. i. First, it has excellent copy mode. It can copy any Blu-ray/DVD Movies at 100% quality lossless. Avoid possible data loss caused by physical disc damage. 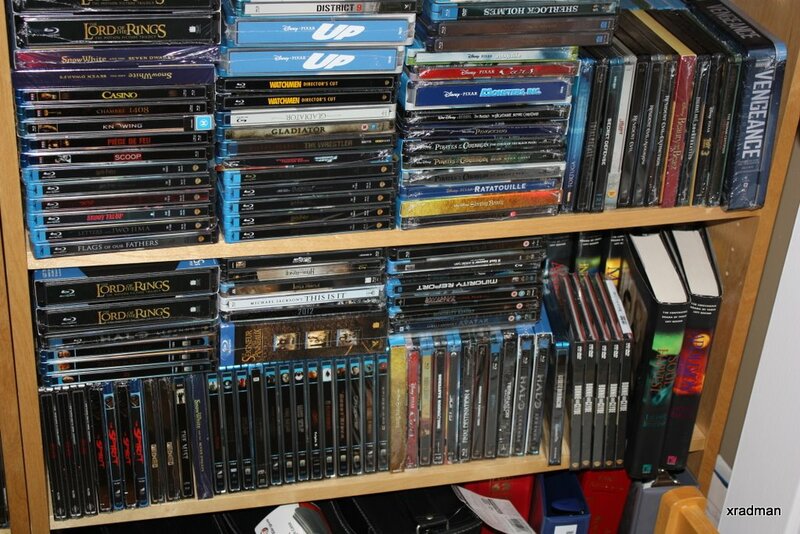 Help Blu-ray/DVD collectors to copy Blu-ray/DVD and preserve valuable data in case of accidents. It can also burn Blu-ray folder/ISO file to disc with no quality loss. Duplicate Blu-ray/DVD content and saves every precious moment. ii. Next, it can rip/copy blu-ray to computer at 6x faster speed. It uses NVIDIA CUDA, Intel Quick System and AMD APP graphic card acceleration technologies to lower system resource occupation and lessen hardware burden. Therefore helps Copy and backup Blu-ray/DVD movies at a high speed. 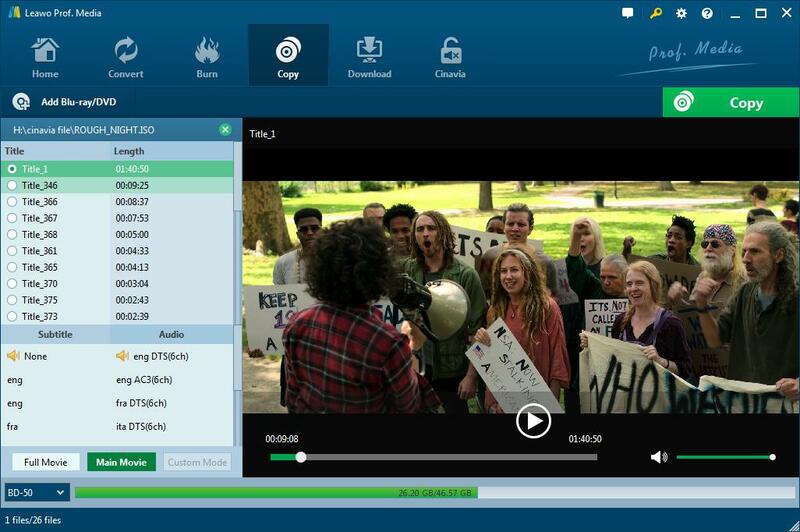 * Full Movie – Copy the whole content as well as all the subtitles and audio tracks. * Main Movie – Select the main part of the movie loaded with main subtitle and audio track for copying. * Custom Mode – Free to choose any part of the movie as well as subtitles and audio tracks at will for copying. * Burn ISO/Folder – Burn Blu-ray/DVD ISO image files or folder to Blu-ray/DVD Disc. iv. Finally, it has powerful additional functions. It is very easy in operation but powerful in function, this Blu-ray Copy makes Blu-ray/DVD discs copying easy to process. It offers new users an intuitive and simple operating procedure and layout. For experienced users, it provides multiple customized functions to fulfill their need of Blu-ray copy such as 3D effect, retain subtitles and audio tracks. 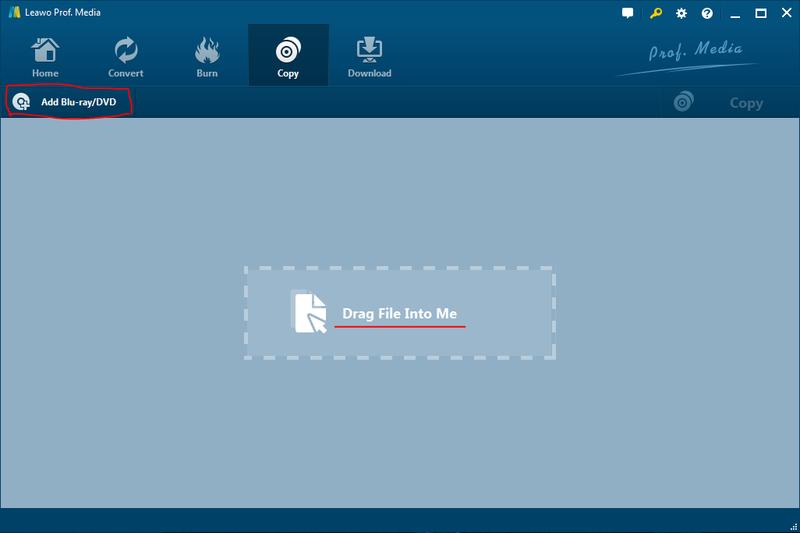 Step 1: Download and install Leawo Blu-ray Copy on your computer, and then kick off the program to enter the home page as shown below. Step 3: Introduce source video. You have two options to introduce source videos. Under Home button, you will see a drop down boxes that says Add Blu-ray/DVD, click it then you will see three options: you can add from CD-ROM video; add from folder or add from ISO file. 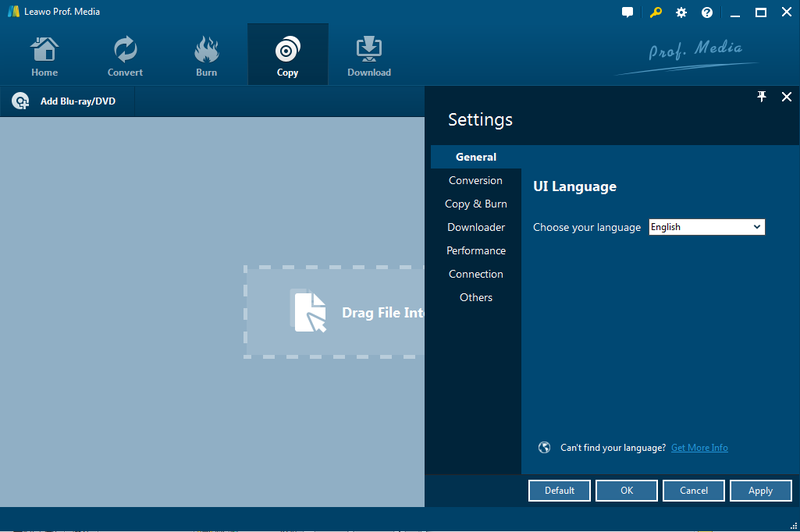 The second and the simplest way are to drag file directly into the program. Since you are new in this, your only option is to add file from CD-ROM. Step 4: Chose mode. After you introduced your source video, you will see an interface like this. You can choose Full Movie, Main Movie or Common Mode for copy. Step 5: Saving settings. Click the big green Copy button on the top right, then you can choose folders to save your copy. Step 7: Wait. All you have to do is for Leawo to do the magic. It takes only a few seconds to copy a 4 minute long Blu-ray video. MakeMKV is a free and patents-unencumbered format converter, otherwise called “transcoder”. It converts the video clips from proprietary (and usually encrypted) disc into a set of MKV files, preserving most information but not changing it in any way. The MKV format can store multiple video/audio tracks with all meta-information and preserve chapters. There are many players that can play MKV files nearly on all platforms, and there are tools to convert MKV files to many formats, including DVD and Blu-ray discs. Additionally, MakeMKV can instantly stream decrypted video without intermediate conversion to wide range of players, so you may watch Blu-ray and DVD discs with your favorite player on your favorite OS or on your favorite device. HandBrake is a tool for converting video from nearly any format to a selection of modern, widely supported codecs. You can use it to back up Blu-rays or convert video from nearly any format. Freemake Video Converter converts video between 500+ formats and gadgets for free! Convert to MP4, MP3, AVI, WMV, MKV, iPhone, Android. Convert YouTube to anything. It’s absolutely free. No trials or limitations. Aurora is free cross-platform (Windows & Mac) software which focuses on Blu-Rays only. It will burn the Blu-Ray disk into an ISO file, and then burn the ISO file onto blank disks (if you want to do that part). It claims it can “easily decrypt any type of Blu-Ray”, and when I tested it on a Blu-Ray of mine, the conversion was indeed very fast. Compare all the above-mentioned Blu-ray to audio rippers, Leawo Blu-ray Ripper is still my No.1 choice. Why? Look at the reviews and you will have your own answer. As you may also interest to know besides computer, you can convert Blu ray to MP4 in at least 2 methods, please just check the tutorial linked for more details.